Your smile is very often the first thing people notice about you. Maintaining excellent dental health is one way to keep your smile attractive and strong. However, if you suffer from flaws, such as stained, misaligned or damaged teeth, you may want to augment your regular dental care routine so that you can create the bright, sparkling smile you have always desired. Our Torrance cosmetic dentist can help. We offer a comprehensive range of cosmetic dental procedures designed to enhance your smile and your overall appearance. The right treatment or combination of treatments, or a smile makeover, can fill in unwanted gaps between your teeth, alter the size or shape of your teeth, correct misalignments or malocclusions, change the color of your teeth, replace lost teeth and restore old or damaged fillings or prosthetics, such as crowns or bridges. Cosmetic dentistry has advanced dramatically in recent years and is designed to not just improve the appearance but also the function of your smile. 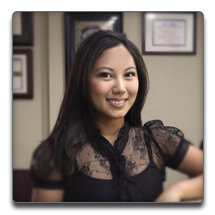 Our Torrance cosmetic dentist will provide you with the information you need to determine the best options for your situation. We can explore various treatments and procedures that may be able to give you the results you desire, including dental veneers, crowns, and Invisalign clear plastic aligners. One of our most popular treatments is teeth whitening, which can help give you a whiter, brighter smile. Teeth whitening or teeth bleaching is a non-invasive procedure intended to remove stains from deep inside your dental enamel. One of the most popular treatments is our in-office whitening procedure, Zoom. Zoom whitening can dramatically whiten teeth up to eight shades and takes just about an hour. Some of our patients prefer take-home whitening systems, which combine powerful bleaching action with custom-fit mouth trays to produce incredible results. Our Torrance cosmetic dentist will evaluate your dental health, fillings, crowns and other restorations to ensure you are an appropriate candidate for these whitening methods. Our Torrance cosmetic dentist also offers inlays and onlays, Lumineers, porcelain veneers, crowns and bridges, dental implants and composite, or tooth-colored, fillings.